One can never have enough cheese or enough cheese knives to cut them with. We picked up this set last time we were at Anthropologie, and at $12 each, the trio makes for a lovely gift. The quality is absolutely amazing and they definitely look and feel more expensive than they are. Available from Anthropologie.com or in stores. What could be more appropriate than a set of leopard print tennis balls for your next Upper East Side cocktail soiree? The perfect balance of posh and playful, this set makes the perfect "add on" item; we're definitely going to snag some of these! Available from HarryBarker.com, from $8. 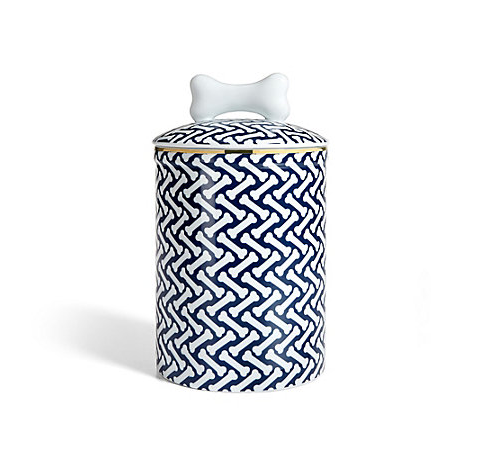 This porcelain dog treat jar is stylish enough to live on your kitchen counter. 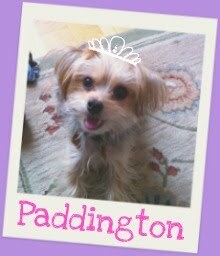 While you could use it to stash treats/chews, we'd fill it with Paddington's knick knacks (how does she have so many random things?! ), like business cards, tennis balls, backup squeakers and clickers, etc. Available from C.Wonder for $40. How cute would these handmade ornaments look tied onto your hostess gift? Though a little on the pricey side ($28/each), they come from Peru and are crafted by fair-trade artisans who use traditional needle felting techniques. Available in a variety of breeds from UncommonGoods for $28 each. 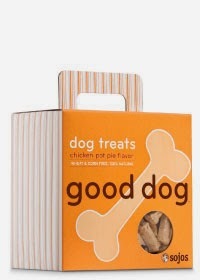 And finally, a bag of delicious dog treats is never NOT going to go over well. 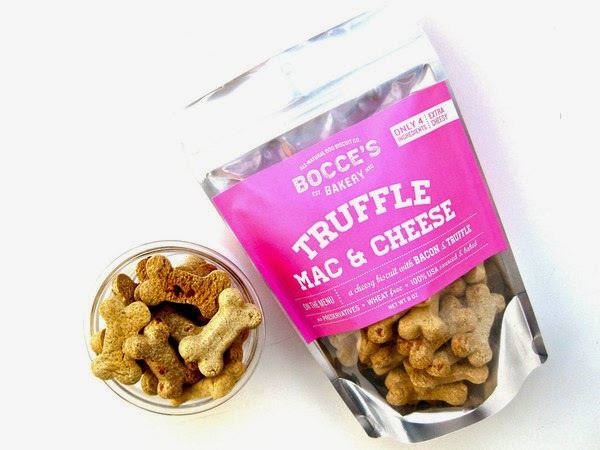 A tin of luxury treats from a canine bakeshop, like Bocce's Bakery, is always going to be well-received-- especially in a gourmet flavor like Chicken Cordon Blue or limited-edition Holiday Feast! What are you go to hostess gifts? Brrrr! It seems like fall has finally descended upon New York City! Cooler temperatures, breezy weather, and darker evenings has made us want to fill our tummies with yummy snacks like mac n' cheese, soup and baked potatoes. Mmmm! 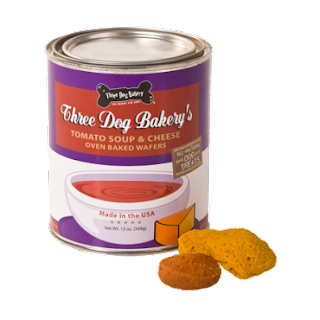 And while these meals are not canine-friendly, check out these tasty treats that take comfort food to the dogs! I mean, who doesn't love mac n' cheese? Bocce's Bakery takes dog treats to the next level with their scrumptious Truffle Mac & Cheese biscuits -- they smell absolutely divine and are a big hit with our fussy eater. Truth be told... we find them quite tempting... Texture-wise, they're also easy to break in half so we're able to more easily portion control snack time. Available from Bocce's Bakery - $9.50 a bag. What could be more yum than tomato soup and a grilled cheese on a chilly afternoon? Three Dog Bakery transforms this lunchtime favorite into Tomato Soup & Cheese oven baked wafers for your pup. 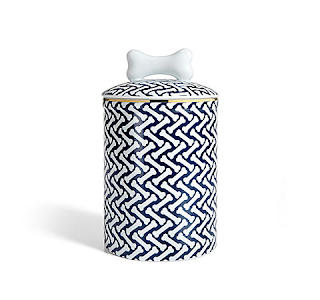 Served up in this oh-so-cute can, we couldn't resist stocking our cupboard with a few cans. Available from Three Dog's Bakery- $7.50 a can. We are long-time fans of Sojos bite-sized delicacies (mmm Peanut Butter & Jelly! ), and thus have to recommend their Chicken Pot Pie biscuits as well. 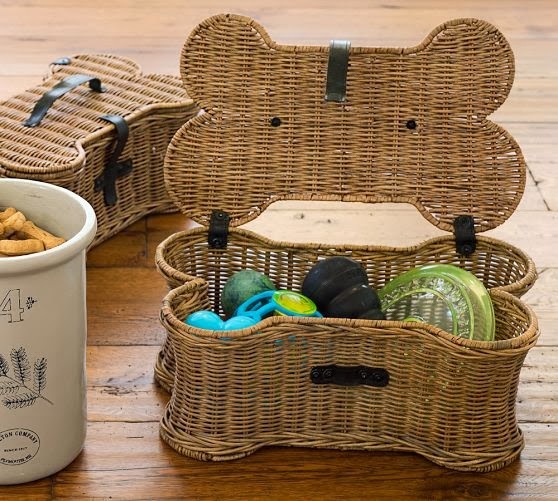 Perfectly sized for the small pup, we use them as training and just-because treats. Available from Sojos- $7.65 a box. Well, this is at the top of our holiday list. So far, we're loving Pottery Barn's dog-focused additions to their line of home goods, and these bone-shaped storage chests are just the bee's knees! If you're doing the apartment living thing like us, odds are you have one main space that is your family-living-dinning-study-room, that also doubles as your dog's main hangout. 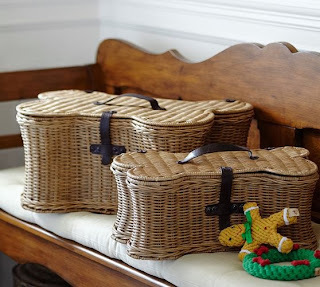 These adorable wicker baskets make it easy to store your dog's stuff in a way that is attractive and won't detract from your decor. While the price tag may keep you from picking them up "just because," we're thinking of filling them with dog treats/toys and giving them as gifts to our favorite four-legged friends this holiday season. Fill the chest with goodies and tissue paper, tie it with a bow, and voila! Available in small ($69) and large ($99) sizes from Pottery Barn's website. 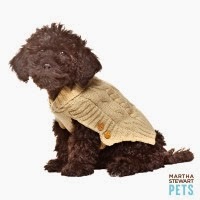 Fall Fashions from Martha Stewart at @Petsmart! 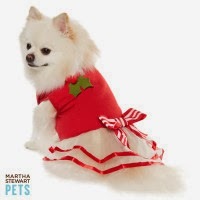 Looking for something adorable to dress your pup up in for the holidays? 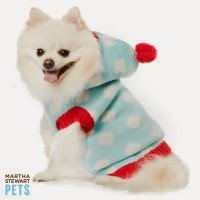 Head over to Petsmart, where the Martha Stewart line is part of the site-wide sale! We've had our eye on several different pieces which are already in our cart and ready to go! Who doesn't love a cozy cable-knit for cold weather? Loving the neutral color of this sweater and the cute little sleeves. Looks really classy and high-end! Seriously- look at the ahhh-dooor-able little tulle dress! Cannot get enough of the candy cane stripe ribbon or the holly accessory on the collar. We also love the fact that it's not going to be too warm for indoor wear. Does your dog don anything festive for the holidays?